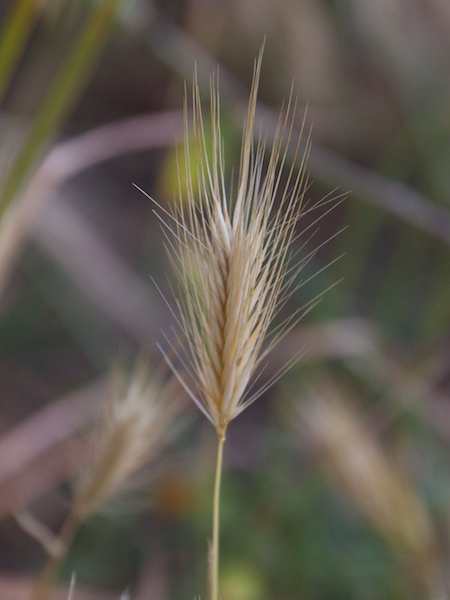 Foxtails tend to go one way: IN. The pointed quills make it very difficult for them to be pulled OUT. I’ve had quite a time removing these from the soft lining in my boots. They become embedded and without a lot of effort, won’t come out. And they hurt! Dogs frequently get them embedded in their noses or in the webbing of their toes, and it is only by going to a veterinarian that they can be removed. In fact, I know of a vet that wore a beautiful gold foxtail pendant around her neck. She said it was given to her because these beautiful little foxtails are what she made her living off of: extracting them from pets! Our wild critters don’t have the benefit of a veterinarian who could help them, but I’m sure our coyotes are as affected as often as the rest of us. I’ve seen them attempt to pull things from their paws — probably foxtails, and I got a photo the other day (darn, can’t find it — I’ll add it when I find it) of a foxtail stuck to a coyote’s nose, which is what made me think of creating this posting. This video is a long one, four and a half minutes. One coyote is removing ticks from the other, and the other is enjoying the exquisite attention and massage, closing its eyes to relish this personal grooming session. The behavior not only serves the purpose of removing unhealthy ticks, it serves to strengthen the social bond between these two. The affection between these two is tremendous. Ticks seem to be out now. 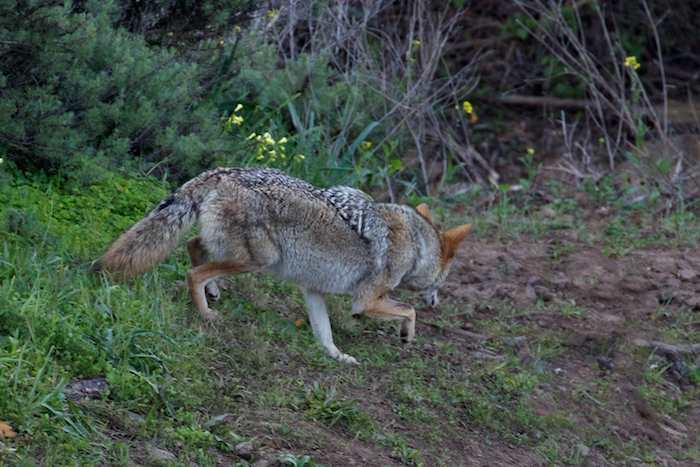 My last posting showed a coyote grooming another — it looked as though ticks were being removed. Here is a coyote photo I’ve blown up — the ticks are very visible on the ears. Since we don’t have deer in the city of San Francisco, there is no risk of Lyme Disease. 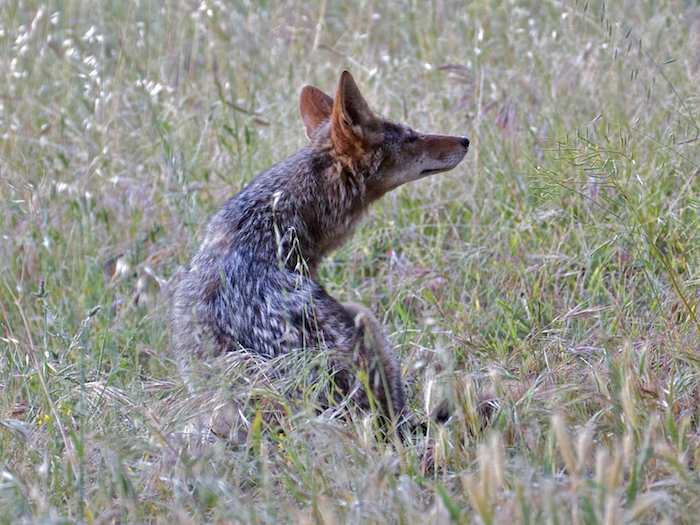 The ticks eventually fall off of coyotes with healthy immune systems. However, I have seen an unhealthy deer which the ticks clung to — it’s entire neck was literally covered with this blood-sucking insect. When I saw this coyote, my first impression was that its paw might be hurt: the paw was being held up in a limp fashion. 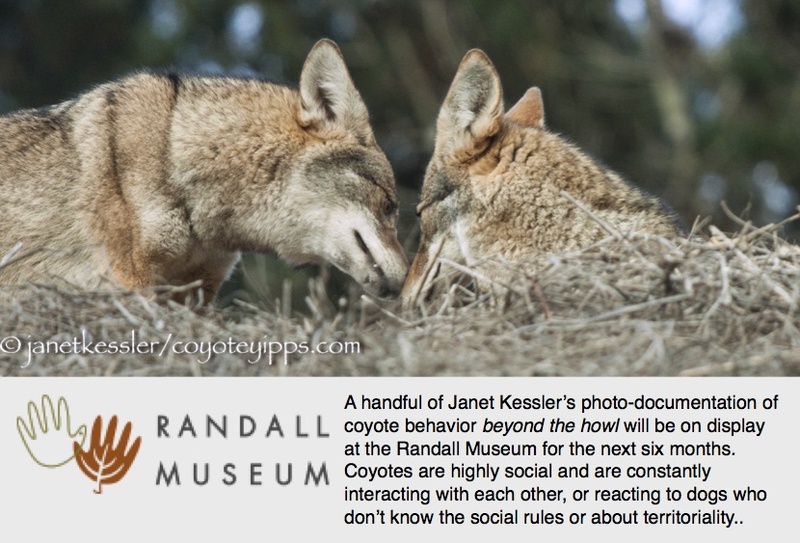 But the coyote then struggled to reach something under her arm in the armpit — that is a hard place to reach. It didn’t take long for the problem to be fixed. The coyote then got up and continued her wanderings. I did not see her return her attention to the armpit. It was probably just a burr or a bug.